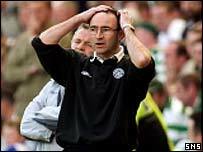 Martin O'Neill has hailed the current campaign his most memorable season at Celtic, despite finishing empty handed for the first time in his three-year tenure. And major shareholder Dermot Desmond has praised the team - and new league champions Rangers - for taking Scottish football to new heights. O'Neill's side, defeated by Porto on Wednesday in the Uefa Cup final in Seville, dragged themselves up off the floor to beat Kilmarnock 4-0 at Rugby Park. But that could not prevent Rangers wrestling the trophy from their grasp on goal difference with a 6-1 win over Dunfermline Athletic at Ibrox. "I can't imagine we'll feel the same heartbreak again," said O'Neill after his side recorded their biggest victory at Rugby Park since 1983. "But we won the treble in my first season and the league last year, but this is the most memorable season I can imagine. "I hope I speak for the players in this has been a truly memorable and fantastic season. "These things don't come around that often and I want to be wrong, but it might be a few years when a Scottish club contests a European final again. "I just know that the effort, determination and the ability was incredible again after what happened in midweek. "It was a monumental effort. "The team have been superb all season and these boys deserve an enormous amount of credit for themselves, the club and what they have done for the SPL and Scottish football in general." Desmond said: "It was disappointing, but it was a fantastic performance and we must congratulate Rangers on their victory. "It has been a fantastic season and, if you had said at the start of the season that we would lose in the Uefa Cup final, lose in the CIS Cup final when we played so well and have a chance of the title up until the final minute of the season, I would have taken it. "Celtic's stock is higher now than it was last year. "It is a celebration that Celtic have had a wonderful season and a celebration for Rangers that they have won the title. "We have all progresed and let us all let Scottish football progress." Desmond was asked if O'Neill would be given funds to strengthen the team during the summer in preparation for the start of the Champions League campaign. "Whether it is a penny, a pound or a million pounds, I am sure Martin will spend it wisely," was as far as he would go. "The players are extremely downcast"